SEOs get blocked by journalist. I’m not going to get into any he said/she said here. I am more on the side of the journalist than the SEOs who replied to her, but I also think the attitudes from both sides needed a bit of tempering. I see it from the journo’s side because a) it’s super annoying to get bad/persistent “outreach” emails asking for something I don’t want to/can’t give, and b) she has every right to approach her writing the way she wants to. 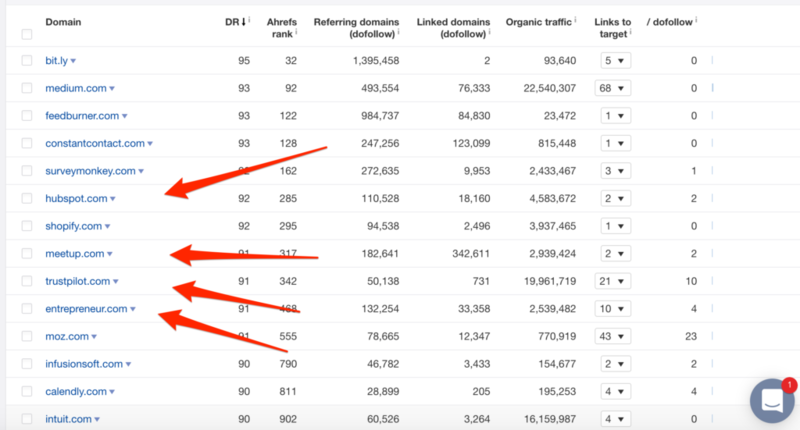 I also see it from the SEO perspective, because I too would like a link from the Times, as an SEO and an entrepreneur building a business that gets a lot of business from organic rankings. The bigger question to me, and the thing that quite honestly annoys me (and always has about the links-SEO world), is that the SEO side seemed/seems unwilling to recognize that an unlinked mention from the NYT or any other big publication can be a HUGE win for you. Here’s how I’d put it to work (and, let me also tell you how it can directly benefit SEO). The journalist’s take on being asked for a link was that she has already helped you out by quoting/mentioning you in her article. I actually completely agree with this because mentions in a national/international publication are a big deal and can instantly lend credence to you/your business as an authority. Why else would there be a big industry around buying links from these sites that are mostly nofollowed? That’s right, the first logo mentioned in that site’s homepage logo ribbon does not link to the site. So why is it there? Because it is social proof, and Michael knows that by showing that he has been covered on BusinessWeek that he will build trust and likely earn business because he has that credence. 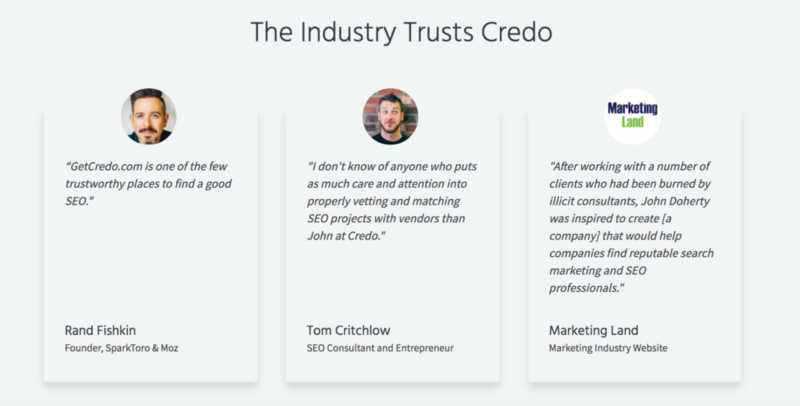 I honestly cannot tell you how many times I have been on the phone with someone where I am building trust with them to let Credo help them hire the right marketing firm, and as they scroll down they go “Oh nice, Rand Fishkin endorses you”. After that, think beyond the direct link itself and start thinking (as an SEO!) about the other content you can build around the strategies you employ to help you get great mentions and links. Those links are awesome and I am super happy that they chose to link to me. But can I put those mentions to work for me and will they long term benefit my business and my organic traffic (and thus business from that organic traffic)? Putting it on other content, like the HARO piece and conference presentations, which all earn me links. We’ve also used them to get me writing access to places like Entrepreneur, in pitches to various podcasts to get me on as a guest, and more. I met a VP from TrustPilot, which led to a guest post (and a link!) and more importantly an introduction to someone here in Denver who has become a good friend and colleague. Having mentions and viral effects can lead to this sort of thing. That LinkedIn post will probably add six figures in revenue to my business over the couple of years following it, and the opportunities it led to have been insane. Relationships make the business world go round. I have a lot of people that I send work to through Credo, who are not listed publicly for various reasons, because I know them and their work and trust them. I’ve sent them some incredible clients, clients that my company was able to generate because of our relationships in the digital marketing and entrepreneur industry/community. They are all promoting each other because they have a relationship. They’re not looking for a link or a quick hit! They’re not looking to “scale”! They’ve built long standing friendships and relationships that over the long term have massive impact on everyone’s business! I’ll go out on a limb and say that almost every SEO that responded to the journalist’s tweet yesterday will never get a mention from her on the Times. That relationship has ended before it even started. If you want to grow your business, grow your network, meet incredible people, and maybe get a few links that actually matter then you need to invest in relationships first. Full stop. No negotiation there. Finally, let’s talk SEO for a minute. Sigh. 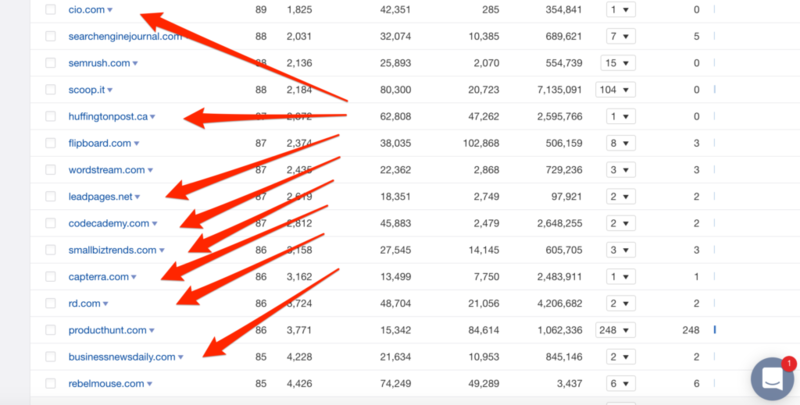 I purposefully don’t write much about SEO on this site these days because I have greatly expanded what I think and write about in the last few years, but I think this part is necessary to this post. SEOs love to talk about “entities”. 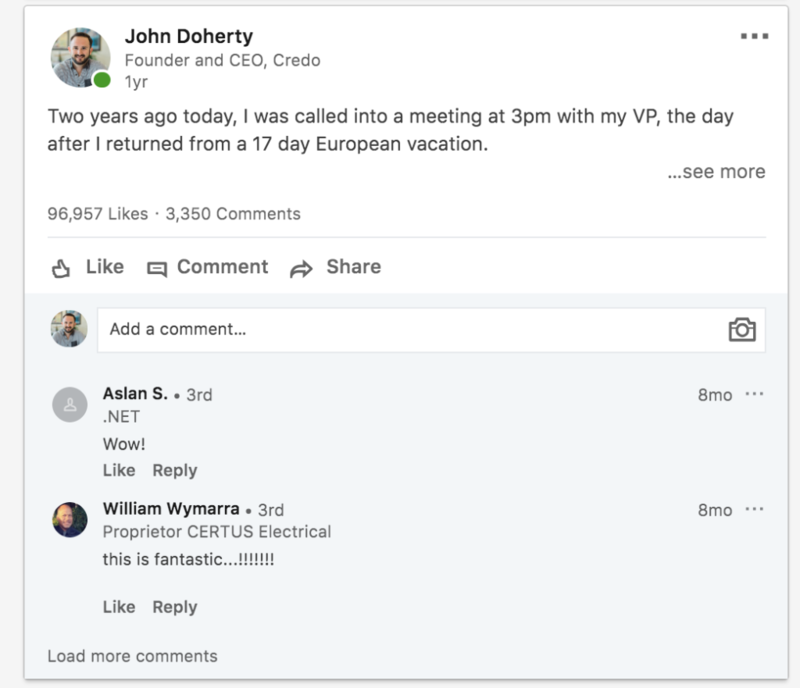 I didn’t understand entities for a loong time (and am still by no means an expert), but we’ve seen Google (and maybe others) invest in this idea of a “being” or a “company” quite a bit over the last few years (Google+ anyone??). I also heard directly from a Googler that because Google knows entities, they can and will associate your brand/name (unlinked even, which I specifically asked about) with the topic that the piece of content where you are mentioned is covering if your brand is associated with that topic enough. It’s not a link-equity passing link, sure. But it’s a topic-related play that, if you are paying attention to where the web is going, may be even more powerful. If you’re not paying attention to topic relevance as an SEO and just keep talking about “backlinks”, then you are going to have a very bad time in a few years. So that’s my take. This is why an unlinked brand mention can be a great thing for your business and you personally even if you do not get a link. * Correction from earlier. I thought the journo was at the NYT. She was at the Times in the UK. This has been corrected. I missed the thread, but I think that it’s a bad user experience and shoddy journalism for them NOT to link to the relevant entity/site when they mention you. It’s called citations and it’s standard in academia to link to your base sources. So why do journalists omit relevant links? It is SUPER frustrating to read an entire article, entirely about a specific person or event and yet have no ability to be referred to the correct resource. I have to pop-up a separate tab, do a search and HOPE that Google has the RIGHT person/entity or event and more often than not, I can’t find it. That’s just dinosaur journalism right there, unwilling to actually help their readers because of what? She’s annoyed she gets requests to cite her sources? Maybe if she linked to them in the first place she wouldn’t get requests to add them in retro-actively. I guess it’s a question of what “cite” means. In paper academia, they cite it meaning they footnote it. It’s not a link (aka that passes something like link equity which has monetary value). I also don’t think a link is always a help to the reader, or necessarily called for always. I did not see the twitter discussion either, but going off of your post here, part of the issue on wanting a link is that brand mentions are hard to measure. We want as much data as possible as it makes our decision making process more robust. As well, even if a linked mention, and a non-linked mention boosted our site equally, it would still be great to be able to check in our analytics and see those direct clicks coming in. It’s also good for reporting to a client..’we landed a you an article and it brought you this many visitors, which converted at x% ‘ etc. And yes, I agree it probably is a bit annoying for the journalist, especially since they may not have control over the final published product and outbound links. I am not disagreeing here at all, and I too want that data. But is you wanting that data reason to say that she should be linking to you? Not at all. Their site, their control. Thing is, maybe the journalist doesn’t understand SEO and the extra value a link brings, (not the specific journo in the twitter feed, but in general) so it doesn’t hurt to ask. An SEO can always check the rest of the site to see if there are any outbound links at all to help them gauge what that answer might be. But most publications fully understand the value of links – they’re hot on internal links, something either done via a tool designed to tactically link certain words and phrases to certain pages, or they drum it into writers to add them (freelance or staff).